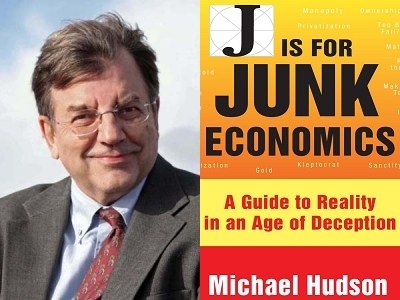 We discuss Michael Hudson’s book, J is for Junk Economics: A Guide to Reality in an Age of Deception, with an emphasis on the degradation of economic vocabulary that hides the real state of the economy; language affects peoples’ perception of reality; history of economic thought no longer taught; classical political economy focused on society’s unearned income or rent; the rentier landlord financial class; fictitious capital; the real reforms of the progressive era; classical political economists expected capitalism to evolve into socialism; classical economic concepts of value, price and rent; productive versus extractive economic sectors; public financing of infrastructure a windfall for the private sector; effects of the tax deductibility of interest; monetary policy and the Federal Reserve; economics is political – politics has always been about who is going to get what; National Income Accounting; fiscal policy and Modern Monetary Theory; the three stages of debt leveraging. This encore show was broadcast on December 17, 2018. This entry was posted on Sunday, December 16th, 2018 at 5:15 pm	and is filed under Censorship-Propaganda, Disaster Capitalism, Econo, Education, Freedom, Guns & Butter, Privatization, Protest. You can follow any responses to this entry through the RSS 2.0 feed.